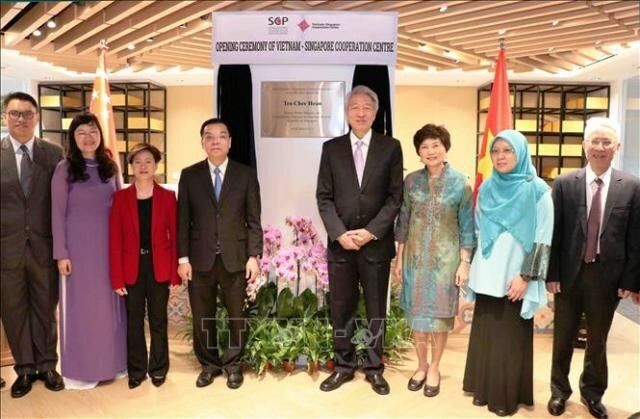 Speaking at the ceremony, Singaporean Ambassador to Vietnam Catherine Wong said the predecessor of the centre is the Vietnam – Singapore Training Centre which was established in 2002. By now, more than 10,000 Vietnamese officials have joined courses at the centre in such fields as languages, communication skills, economic development, trade and tourism, public governance, management and law, and information and communication technology. In the context of Vietnam’s rapid growth and development, the upgrade and renaming of the centre is to manifest Singapore’s long-term commitment to addressing development demand of the countries and narrowing the development gap in the region, the diplomat said, adding the new establishment aims to organise technical support projects in broader fields, including urban zoning, education services, consultancy and assistance projects, and charity and humanitarian activities. She expressed her hope that the new centre will create a foundation and become a development assistance partner as it involves many prestigious private and state offices and organisations. Vietnam and Singapore established a strategic partnership in 2013. Singapore is the third largest foreign investor in Vietnam, and its enterprises hope to continue investing in new fields like energy, urban solutions and e-economy. A prominent point in the bilateral relations is the long-term partnership in human resources development.